In today’s tight labor market, unfortunately businesses have positions going unfilled for months at a time as hiring managers across a wide spectrum of industry are finding that traditional methods of recruiting skilled talent have become pricey and unsustainable. As a result, an old idea is becoming new once again: apprenticeship is taking root across the nation because it offers a cost-effective alternative to staffing those hard-to-fill positions. Apprenticeship isn’t a new idea. In fact, it’s a really old idea. That’s a good and bad thing when it comes to helping people understand what a CareerWise Colorado apprenticeship means for students and businesses. On one hand, “apprenticeship” is understood to be a rigorous on-the-job training program that results in a skilled worker for the business; and that’s still true. But on the other hand, we typically think of an apprentice as an adult man working in a skilled trade such as plumbing or pipefitting and assume that apprentices don’t have the means or the ability to go to college. Modern youth apprenticeship paints a different picture of an apprentice. 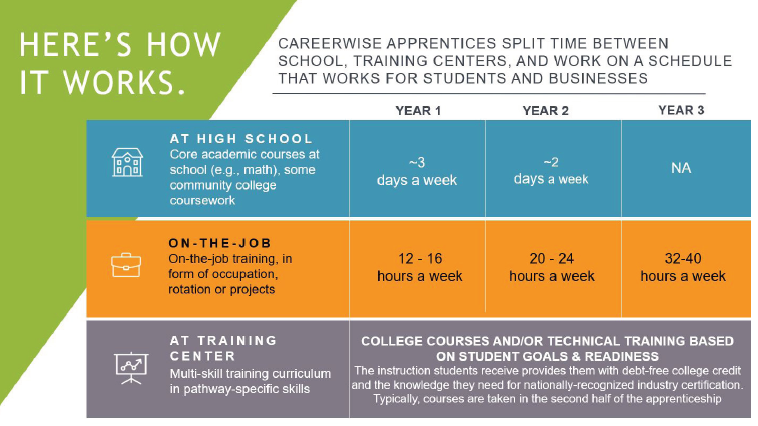 First of all, CareerWise apprenticeships are typically three-year experiences that begin in the student’s junior year of high school. Secondly, a modern apprenticeship is not limited to the skilled-trade professions. In fact, CareerWise pathways include Information Technology, Healthcare, Advanced Manufacturing, Financial Services and Business Operations. These fields have been identified by a variety of businesses and industries as areas of high-growth, high-demand, and high-paying jobs. The benefits to the apprentice are apparent— meaningful work experience, the opportunity to earn debt-free college, a paid wage and the development of a professional network. But apprenticeship is not philanthropy, it’s investing in a smart business and recruitment strategy. Apprentices perform meaningful work in hard-to-fill positions for employers, and their production creates positive return on the investment. The logistical model of a modern youth apprenticeship—the practical nuts and bolts of making sure it works for both students and businesses—also sets it apart from traditional apprenticeship. 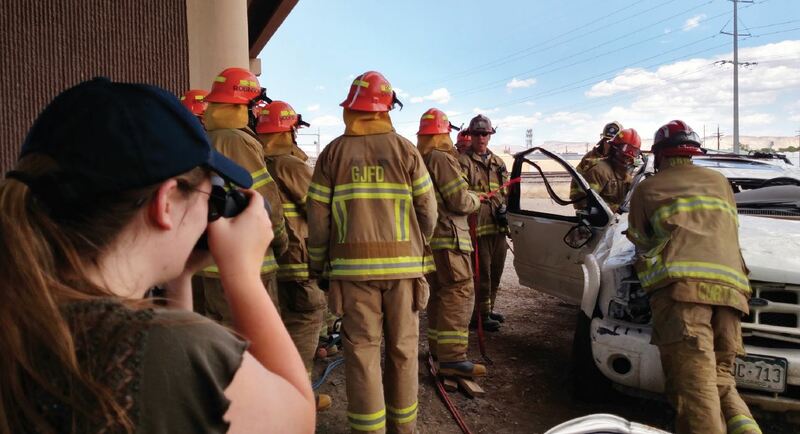 CareerWise is a nonprofit intermediary that is working in Grand Junction and statewide to connect the complex structures of education and industry. CareerWise is in place to help businesses connect with the education system, recruit students, develop training plans and provide ongoing program support. But there are no government incentives or subsidies; businesses, schools and students are motivated to participate by the inherent, natural incentives that the system offers them. So, next time you hear the word “apprentice,” challenge yourself to think of a student in a suit creating an accounts receivable ledger, or providing online technical support for your customers, or…well, you get the picture—imagine an apprentice contributing meaningful work in your business.